The Bonnie Bucket Bag Sew Along begins! 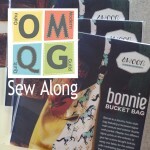 The OMQG Bonnie Bucket Bag Sew Along is about to begin! I am thrilled to be hosting this Sew Along for the guild, and hope everyone has fun making this fantastic bag! !I I know some have already completed their bag, but, I wanted to be sure everyone had their pattern before posting any information. Does everyone have the supplies required for the bag? Are there any questions about these supplies? Please post in the OMQG Facebook Group page if you have questions. If you have an Instagram account please tag @oahumqg with your photos so they will show up on the Oahu Modern Quilt Guild website!! And be sure to use #oahmqg #omqgBonnieBucket and #omqgsewalong with your photos as we go through this together! The plan is to have our finished bags ready for Show & Tell at the March meeting, but remember, this Sew Along is at your own pace! I would like to share some techniques I have learned which have made my bag making experience easier. With a little preparation, I like to focus on the assembly of my bag. 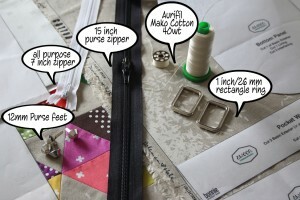 This preparation helps me make more bags from the same pattern in the future, too. I will also be sharing some additional ideas and steps to make your bag a little different than the pattern. These additional steps are not required to finish your bag. I will note where the optional steps are so you can skip them if you prefer. Now, down to the business of what goes into making the Bonnie Bucket Bag. 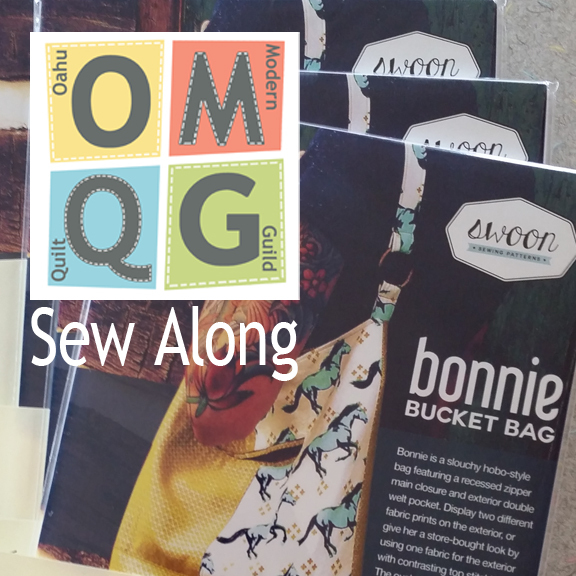 Pattern: You will need the pattern….Bonnie Bucket Bag…from Swoon Sewing Patterns. You can choose to download the pattern and print it at home, or order the printed pattern to be delivered through the mail. Yes…the second option is slower, but, the printed patterns are amazing. Fabric: The pattern requires 1/2 yard of 44 inch wide quilting weight cotton for the main exterior fabric and 1/2 yard of 44 inch wide quilting weight cotton for the basic exterior fabric. You will need to add extra fabric to this if you want have directional fabric to match, or if you want to fussy cut some of your pieces. For the lining you will need 2/3 yard of 44 inch wide quilting weight cotton. Notions & Hardware: In addition to the fabric you have selected for your bag, there is a variety of supplies and notions that go into making your bag unique and functional. Some of the supplies you will see in my photos may be different than what you have gathered for your bag. Please feel free to comment and ask questions about any of these supplies. I am only sharing the supplies I am familiar with and know how to use. If you have your own supplies and notions you are familiar with, please use those. There is no requirement for you to use the supplies and notions I am using to construct my bag. I choose to use 40 wt. Aurifil Mako Cotton thread. It is a bit thicker than average, works well for assembling my bag, and looks great for the topstitching. And it comes in some GREAT colors!! A thicker thread will require a larger needle, so I use a Microtex or Topstitch size 90/14 needle. The pattern says you will need a 15 inch all-purpose zipper. I am choosing to use a purse zipper which is very similar to an all-purpose zipper, except it has two sliders that meet head to head, so you can open your purse from either end. There are lots of choices for the strap rings/loops that connect your purse to the strap. You can use O rings, rectangle rings/loops, or D rings. The rectangle loops I am using are 26mm/1 inch with a nickel finish. I will be adding purse feet to the bottom of my bag. Near the end of the bag construction I will be showing the steps I use to attach these to the bag. You will need a Fray Check, nail polish, or similar product for application to the fabric when installing the purse feet. Purse feet also come in many sizes and colors, but I only add purse feet to bags that have a flat bottom where a piece of Peltex 71F is used. This type of super stiff interfacing is perfect for attaching the feet and provides a sturdy base for the feet to support. Again, this is an optional step and not required for you to finish your bag. I don’t like cutting my fabrics on the fold when a pattern piece requires it. I prefer to make a mirror image of the pattern piece and tape it together with the main pattern piece to make a whole pattern piece. This also enables me to fussy cut pattern pieces if I am using a print fabric, and makes it easier to match directional fabric. 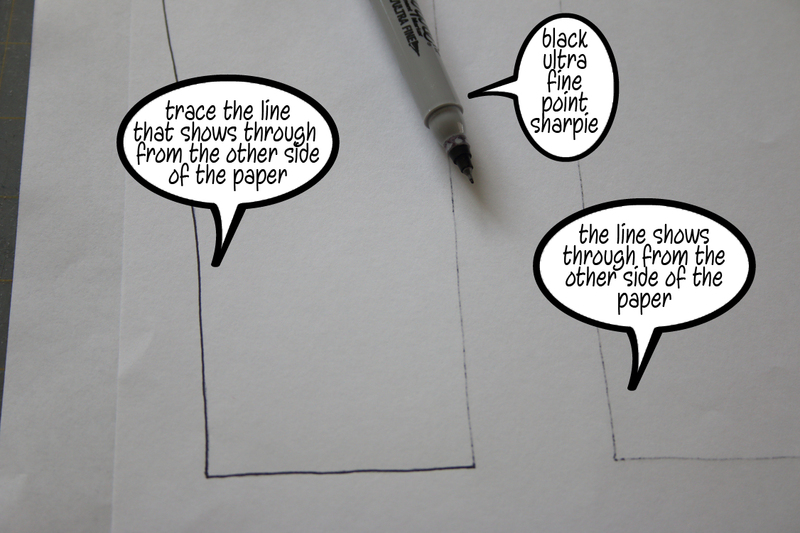 The technique I use is to trace the pattern onto plain printer paper with a black ultra-fine sharpie. I turn the traced image over and retrace my lines onto the back of the paper so it becomes a mirror image of the pattern piece. 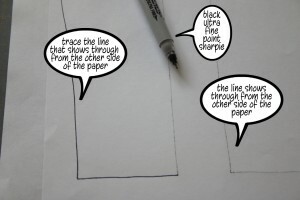 The sharpie will bleed through the printer paper just enough for you to see the lines you traced, but, not so much to mark up the main pattern piece. 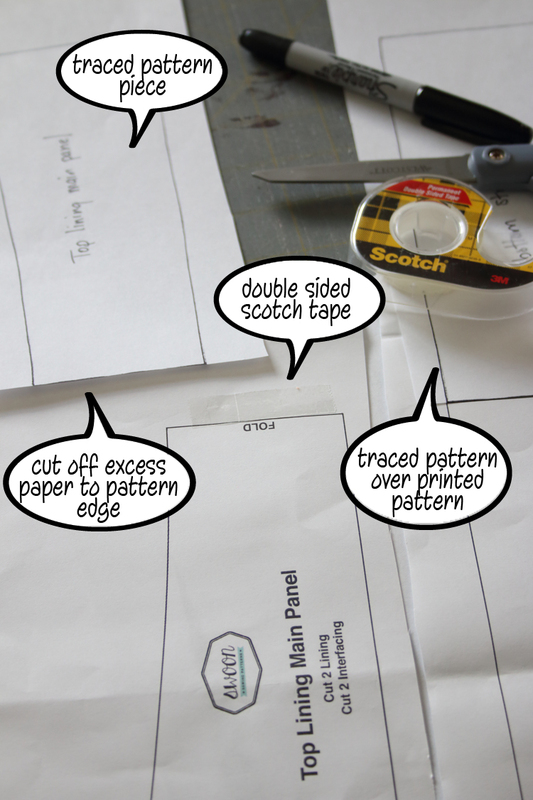 Then, using double sided tape, I attach the pattern piece to main pattern piece where it says FOLD. After I have traced, and taped all my pattern pieces and parts, I apply clear contact paper to the right side of the pattern pieces for stability. If you would like to use adhesive shelf liner, you can apply it to the back of the pattern piece so you can still see the pattern marks and directions. This makes the pattern pieces a little bit stiffer and they become tracing templates so I don’t need to use pins. 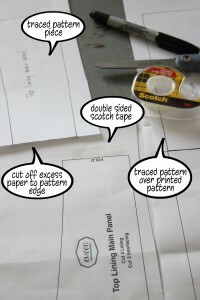 I cut my pattern pieces out after the contact paper is firmly adhered to the paper. For some the preparation of the fabric will be minimal. For others it will require more work depending on what you want your bag to look like. 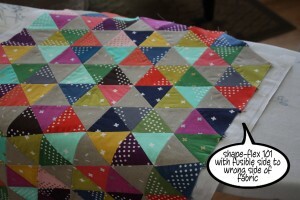 I have chosen to create 2 of the panels from pieced 60 degree triangles. It took a while to complete this panel, but, I think the look will be worth it. I have also found it to be very helpful to iron the woven fusible to my fabric pieces BEFORE I cut them out. There are some exceptions to this with this pattern: The Bottom Panel, Handle Connectors, Pocket Panel, Bottom Strip and Pocket Welts. Basically the Main & Basic Exterior Panels and lining pieces are the only fabrics that I have ironed the woven fusible to. 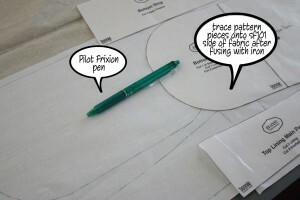 Then, I use a Frixion pen to trace the pattern pieces on the wrong side (the side with fusible on it) before cutting. I am terrible with pins and constantly poking myself with them, and this eliminates the need for pins when cutting out pattern pieces. The pattern pieces last longer to without all the pin holes in them. 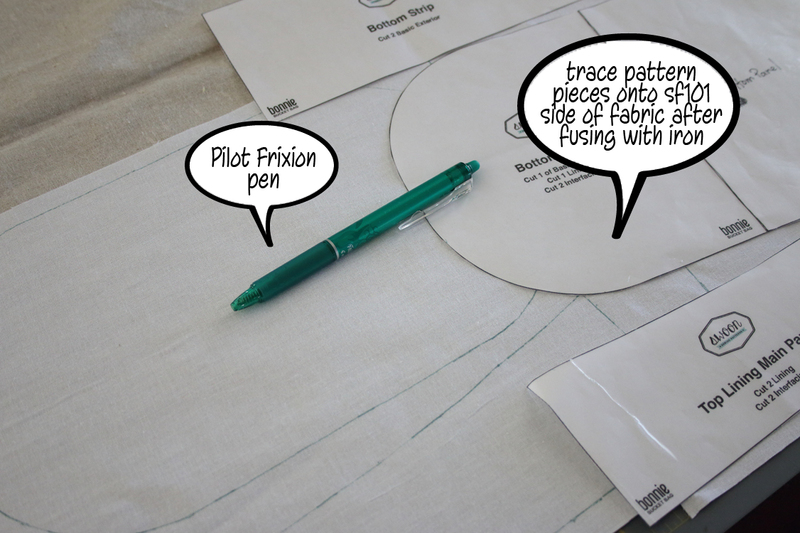 Also, this technique eliminates one step of cutting since the woven fusible interfacing is already ironed onto the fabric. WIN!!WIN!! So, hopefully everyone will have their fabric cut out, and all the interfacing fused and ready for the first steps to constructing the bag! I will announce on the OMQG Facebook Group page when the next steps are posted so everyone can follow along. I can’t wait to see all teh different Bonnie’s we will be making…..let’s get stitchin’!! 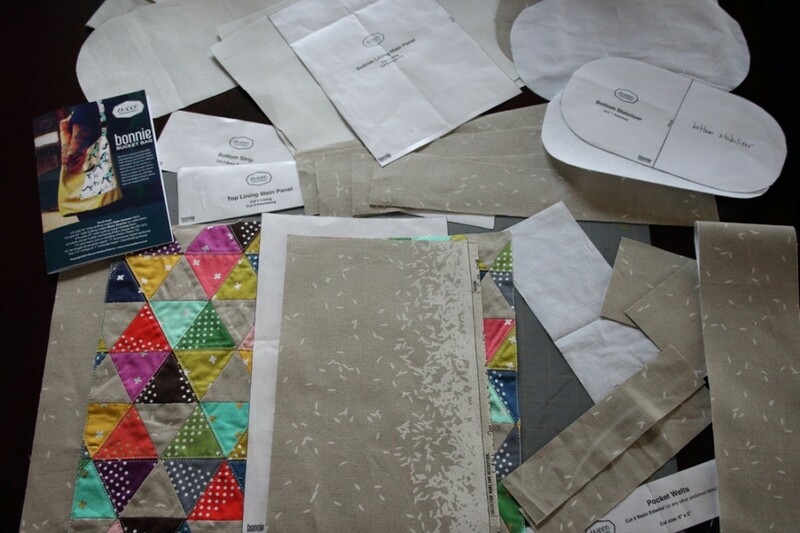 all my pieces cut out and prepared….ready to assemble a Bonnie Bucket Bag!